Well, you've got to start somewhere, and with navigation the somewhere is thumb on map. In order to appreciate how I learned my lessons, a little personal history is necessary. As a kid, three things fascinated me: music (mostly Baroque and chamber), books, and airplanes. Unfortunately, they did not fascinate my parents, and so the classic struggle was born. The upshot was that I got an after-school job in a gas station, saved my money for a couple of years (although I was only fourteen I already had the capability to form long-range plans and put them into action), and near the end of my sixteenth year I ran away from home to San Diego where I rented a room and started flying lessons. I was quickly tracked down, like any incompetent criminal, but not before I was just about ready to solo. My father, filled with trepidation, came down from Los Angeles to witness the great event. After I managed to drag the 65 hp "Airknocker" around the patch a few times and got my shirttail cut off, we struck a bargain. I would be permitted to remain in San Diego and get my private pilot's license if afterward I would return home and go back to school. My father was a good guy and doing his frustrated best to control his unruly son (small airplanes terrified him, as they do, to this day, everybody in my family), so I agreed and went on to get my license. After I got my license, I returned to Los Angeles, but I did not forget about flying as my family for some reason had expected. When they found out that I had traded my car for an old PT-19 that I was fixing up and planning to fly, the you-know-what hit the fan. I soon realized that flying wasn't going to work out, not with all the opposition I was getting; and I realized as well that the stress I was under was a definite hazard to safety. So, I struck another bargain: I promised to give up flying if the opposition to my studying music would cease. And so I took the low road, capitulated to superior force, and drowned my sorrows in Bach and Corelli. Eventually I flew the coop, got married, and for a number of years toured Africa, the Middle East, and India as an itinerant cellist, making a very marginal but interesting living. Along the way, my wife gave birth to two children, one in Germany and the other in Ceylon. Finally, after many strange adventures, and even stranger lands, we ended up in Alaska with a tent for a home, and I started looking around for some way to make a living. It was obvious that Alaska did not hold musicians in high esteem. Well, the answer was not very difficult to find, not for a guy with my mindset. It was written, you might say, in the sky. So, in my 29th year, I packed my family into an International Scout 4x4 I had managed to purchase and went looking for a Super Cub I could afford. In Red Bluff, California, I finally found what I wanted, an old ratty 125 hp Cub that I could have in trade for my car and $2,000 (life sometimes seems to work in cycles). The guy who owned it spent a couple of days checking me out in it -- I had not touched the controls of a small airplane for 12 years -- and it came to pass that on a cold January day I loaded my trusting family, kids and all, into the Super Cub (with survival gear piled all around them), and headed north. Ah, youth... Looking back, I shudder contemplating what I did. On the trip back to Alaska, and for the first two years I owned that airplane, my rabbit's foot got so overworked that I wore it out. Today, there is hardly a hair left on it. But in the process I sure learned a lot. Pilotage is primarily the art of navigating by landmarks. These landmarks can be roads, valleys, rivers, lakes, glaciers, mountains, anything that provides real-time data as to where you are. When using a chart, the usual method is to pick out the landmarks you will be using, along with compass headings and estimated time from one point to the next, and go for it. Pilotage got me safely to Alaska that first year, and to this day I use it when circumstances dictate. Let's take a look at the various landmarks and see how you will be using them in Northern Canada and Alaska. Roads. Flying into the Los Angeles basin, roads are not the best landmarks, but fly into the Yukon Territory or Alaska, and things become very different. Here you have a broad expanse of wilderness with few roads, and every one of them is an important navigational feature. Take the Alaska Highway, for Example. From Fort St. John it winds in lonely splendor along the edge of the mountains to Fort Nelson. There it enters them and winds through passes and narrow valleys to Watson Lake, Teslin, Whitehorse, and Burwash Landing, finally reaching Northway, Alaska (where you clear Customs). On that first adventurous flight to Alaska in the 125 hp Super Cub, we followed the Alaska Highway from Fort St. John through an unforcast blizzard with visibilities at times less than a half-mile in snow squalls to Fort Nelson, where we spotted the road -- clearly marked on the chart -- to the airport. Turning right, we followed the road to its destination, landed, tied the airplane down, got a ride into town, and found a warm, comfortable motel (where we spent almost a week waiting out the storm). All during that flight, there was never any question of where we were, or where we were headed, and if the weather got a bit too tough, well, the road was wide enough to land on almost anywhere, even for a greenhorn such as myself. It was much like flying over a runway hundreds of miles long. All northern roads make good VFR routes. Used thoughtfully, ticking your landmarks off as you pass them, keeping track of time, you will never get lost, and will always have an emergency `out' in case of need. Valleys. Valleys, too, make good routes. To go from Chitina -- at the confluence of the Copper and Chitina Rivers -- to my place, you head up the Chitina Valley until you reach the Nizina Valley, then follow it until you come to the short, rough gravel bar I use as an airstrip. This gravel bar has, since 1968, been marked on the Anchorage Sectional Aeronautical Chart as FEPCO (Pvt). Mountain Passes. For the VFR pilot, mountain passes are a way of life (see illustrations 32, 33, and 33.1). Going from Anchorage to Iliamna VFR, you would follow the Lake Clark Pass; from Anchorage to Gulkana, Chickaloon Pass; from Bettles to Umiat, Anaktuvuk Pass; from Prince George, BC, to Watson Lake, YT, the long pass called The Trench. All Northern passes have one characteristic in common: when the weather gets marginal outside the passes, it becomes dangerous in them. Fog, low clouds, and snow squalls are the most serious, though when the wind gets up, at times the ride has to be experienced to be believed. I must admit I don't much like passes, and when I have the chance I fly above them, often IFR or above the clouds. While I have flown Chickaloon Pass more times than I care to remember in VFR-only Super Cubs, I have never managed to make it through Lake Clark Pass VFR. Each time I have had to fly that route, the pass has been marginal to closed, and, being in an IFR airplane, I have climbed up to altitude, put on my oxygen mask, and shot the approach on the other side. I know too many pilots who have died in passes to feel fond of flying them when the weather gets low. Rivers. Rivers are one of the great navigation aids in the north. Most villages and cabins are along them, and any major river will take you to civilization sooner or later. 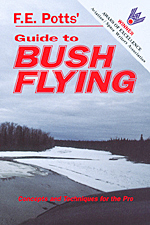 Large or small, rivers and creeks are your VFR highways through the bush. Large lakes. Large lakes can be spotted from quite a distance when at altitude, and make good checkpoints when navigating by dead reckoning or pilotage. Coastline. The coast too is much like a river, with settlements, and, between Cape Lisburne and Cape Dyer, the long lonely chain of military DEWLINE stations. When navigating through a mountain pass to a settlement on the coast, it is wise to plan your heading across the tundra so you intercept the coast several miles to one side or the other of your destination. That way, unexpected wind drift will not get you so far off course that you get -- as they call it in the north -- "confused."